Don’t live with dirty, stained gelcoat. Spruce it up easily by choosing the right cleaners and sealants. Fiberglass is a pretty good boatbuilding material, but gelcoat is its weakness. Although gelcoat feels slick as polished stainless, its surface actually has more nooks and crannies than a Thomas’ Original English Muffin—and it attracts dirt and stains as well as those tasty breakfast treats absorb butter, too. Ask anyone who has transited the Intracoastal Waterway: Tannin in the water from rotting vegetation leaves a tea-brown mustache, pretty much in the shape of the bow wave at 6 or 7 knots. A rite of ICW passage is cleaning off the stain once you arrive at your destination, an awkward chore with the boat in the water. 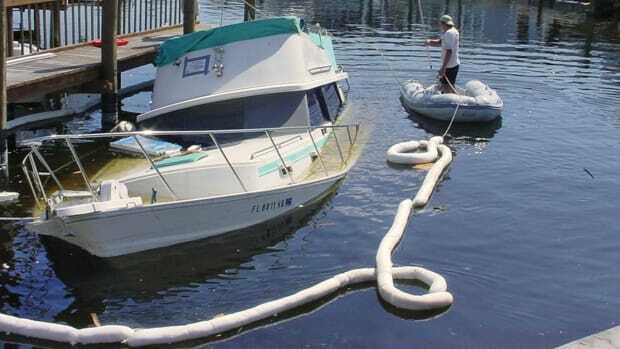 Even if your boat’s clean-shaven, you still have to deal with stains from bird droppings, water streaks, exhaust, general airborne pollution, spilled wine, and, my personal favorite, ink from a half-eaten squid left on deck by a seagull. (I assume it was a seagull, anyway.) How do you handle all of these, without developing rubbing-compound shoulder? Choose the right products, and in many cases you’ll need less elbow (or shoulder) grease than you think. 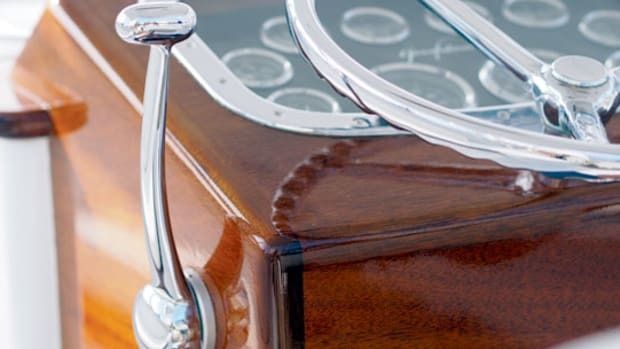 Gelcoat care involves three stages: Cleaning, protecting, and polishing. Keep up with cleaning and protecting, and you shouldn’t need to do much polishing. A fourth stage, restoration, is necessary only as a last resort, and best left to experts. Let’s hope it doesn’t come to that. Cleaning is easiest, and there are plenty of modern concoctions to help you out. Before selecting any cleaning product, read the label to find out what’s in it, what kinds of stains it’s designed to remove, and how to use it. Pay attention to any warnings on the label, too. Acidic cleaners and stain removers are effective, but many require protective measures. 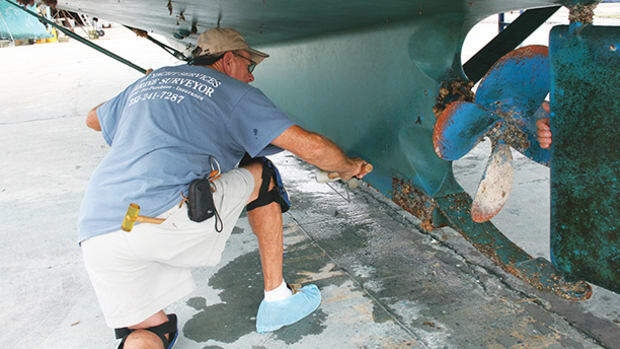 MaryKate On & Off Hull & Bottom Cleaner (www.crcindustries.com), for example, contains phosphoric, hydrochloric, and oxalic acids. The safety data sheet says, “wear protective gloves/protective clothing/eye protection/face protection. Avoid release to the environment.” I’d try something milder first. Once the stain’s gone and the gelcoat’s clean, you have to rewax. Some folks still swear by carnauba wax, while others have switched to longer-lasting polymer sealers. Which is better? Depends on who you ask. Derthick at Ashland says, “If the gelcoat is in good condition, it’s best to just use a conventional wax to protect the surface.” Xistris, on the other hand, says polymer sealant takes more time to apply, but lasts longer and is better for the gelcoat. “Polymer sealants are like suntan lotion for your boat,” she says. Everyone knows how to wax gelcoat, but most of us don’t do it often enough. More is better, within reason. 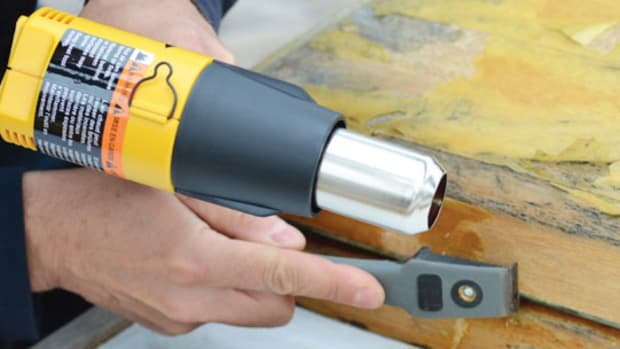 Polymer sealants aren’t so straightforward, says Garry Dean, a professional detailer from Tampa, Florida, who has developed Detail Juice, a line of eco-friendly products for maintaining the finishes of cars, motorcycles, and boats (www.detailjuice.com). His Bionic Banana Shield is a “synthetic polymer hybrid wax” that prevents dirt and oxidation from getting into the gelcoat pores. Even under the Florida sun, one application should last at least six months, says Dean. Won’t two layers be better? Maybe not. In theory, you can apply linear polyurethane by rolling and tipping with a brush, but you need to be handy. A friend of mine tipped and rolled his aging sailboat, once cherry-red but long-gone to pink. It looked better afterward, from a distance. Up close, it was an obvious brush job. 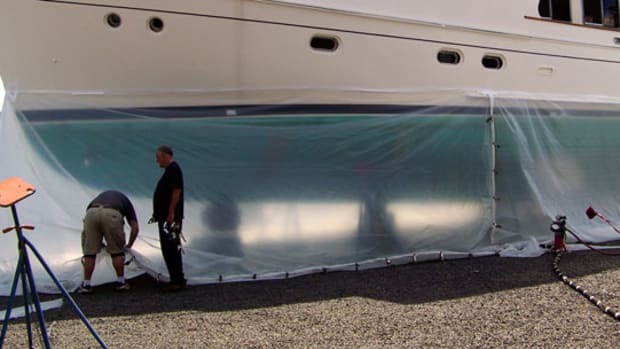 The best way to apply LP involves a spray gun wielded by an expert in a paint bay—like those at Hinckley Yacht Services (www.hinckleyyachts.com) in Portsmouth, Rhode Island. I asked Dann Lockwood, HYS manager, what you’re asking right now: How much? “It depends,” he replied, “Do you want a clear coat finish? Three boot stripes? A cove stripe? Are fiberglass repairs necessary? 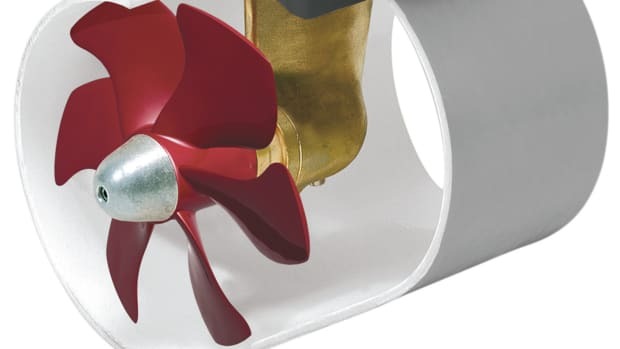 Must components be removed and reinstalled?” Taking these variables, and others, into account, Lockwood said the cost range for a 25- to 50-ish-foot boat, hull only, is between $200 and $425 a foot. “Of course, the smaller the boat,” he added, “the less the overall cost, generally speaking.” Larger boats are usually quoted on a time-and-materials basis. Decks are another story. “Fittings, hatches, and all the other deck-layout stuff greatly affect the labor involved,” said Lockwood. Does the owner want the “proper” job, with all deck fittings removed and reinstalled? Would he consider brushing versus spraying primer and topcoat? Is the deck solid, or are there soft spots or other repairs to tend to? “Every boat is different,” he said. There’s a right way and a wrong way to compound, by the way, and it starts with the compound itself. Don’t use auto compound on a boat; it’s designed for softer paint, so it’s less abrasive and it will take a lot of rubbing to do the job. Compound formulated for gelcoat is more abrasive and cuts faster—never use it on your car, or you’ll be heading for the spray booth. And most rubbing compound contains petroleum distillates. (Wear a mask, so you don’t inhale any particles.) The oil is what restores the color, though. If you’re not comfortable using a buffer, hire the yard to compound your hull, if not the whole boat. (The deck is easier, and you can do it in smaller bites.) Honestly, I’d rather work more and earn the money to pay for someone else to compound my boat than do it myself. It’s not particularly satisfying work, and it takes more skill than you think to do a good job. Wet-sanding? Call the experts. When your gelcoat fades beyond recovery, paint—actually linear polyurethane—is your best friend. Yes, you can re-gelcoat, but why? LP is harder, smoother, more fade- and stain-resistant, and easier to maintain than gelcoat, explains Matt Anzardo, North American marketing manager at AkzoNobel, the parent company of Awlgrip and Interlux. The two materials are completely different, he says: Gelcoat cures via a chain-reaction initiated by a catalyst (usually MEKP, the clear liquid that comes with polyester resin you buy at the chandlery). 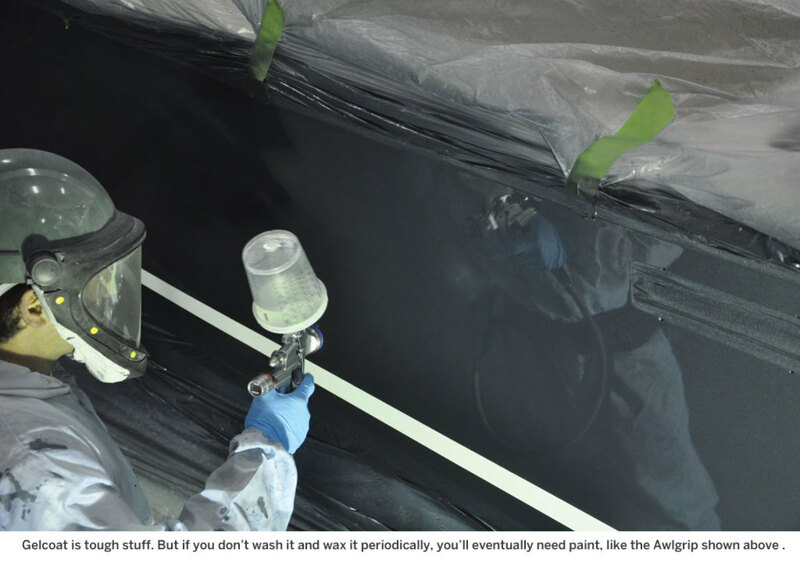 “There’s not a set mix ratio for catalyst,” Anzardo says, “so there’s usually some unreacted material.” And what’s more, aggressive cleaners and compounds open the natural pores in gelcoat and make it more susceptible to staining. Expect to get 10 or more shiny years from a properly maintained LP job. And you’ll never have to shave an ICW mustache again.